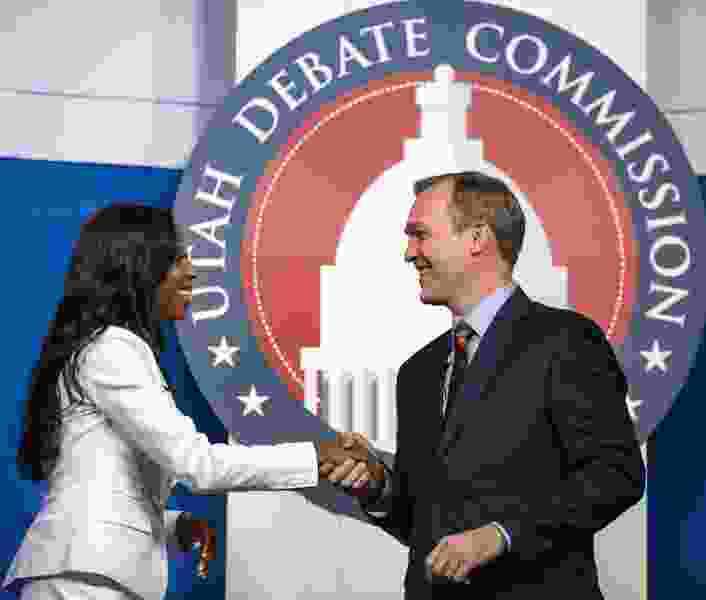 (Scott G. Winterton | Deseret News, pool photo) Congresswoman Mia Love and Salt Lake County mayor Ben McAdams shake hands as they take part in a debate at the Gail Miller Conference Center at Salt Lake Community College in Sandy as the two battle for Utah's 4th Congressional District on Monday, Oct. 15, 2018. Washington • When Rep. Mia Love was born in Brooklyn, she became an instant citizen under a constitutional amendment that President Donald Trump now wants to toss. Love, whose parents immigrated from Haiti and who was the first member of her family to gain citizenship, said Tuesday she opposes Trump’s plan to use his executive power to end what is known as birthright citizenship, a move that is legally fraught in that the Constitution’s 14th Amendment protects that right. Love — a Republican who is locked in a tight race against Salt Lake County Mayor Ben McAdams, a Democrat, in the 4th Congressional District — said the executive branch doesn’t have the authority to change the amendment unilaterally, a point backed by many legal scholars. McAdams also criticized Trump’s plan and laid the blame on Congress for continuing to avoid reforming America’s immigration laws. Trump has ramped up his anti-immigrant rhetoric in recent weeks ahead of the midterm elections, in which his party is struggling to retain control of the House and stem Senate losses. He’s ranted about a caravan of Central American migrants who are traveling to the United States to seek asylum and is now targeting birthright citizenship as a new issue to whip up his support base. Trump told “Axios on HBO” that his lawyers say he can use an executive order to end the practice that anyone born on U.S. soil, including offspring of immigrants without documentation, automatically becomes an American citizen. “It was always told to me that you needed a constitutional amendment. Guess what? You don’t,” Trump told the news outlet. Salt Lake County Councilwoman Jenny Wilson, a Democrat seeking to replace Sen. Orrin Hatch, R-Utah, said Trump’s attempt to undermine the Constitution shows why voters should oppose candidates who support this White House. Wilson’s Republican opponent in the Senate race, former presidential candidate Mitt Romney, didn’t immediately comment. Sen. Mike Lee, R-Utah, said Tuesday that he believes congressional action can change the birthright citizenship but isn’t sure how Trump can do it by executive decree. Rep. John Curtis, R-Utah, said he shares frustration with Trump about the nation’s broken immigration system, but jettisoning a constitutionally protected right isn’t within the president’s power. Utah’s other federal elected officials did not respond to requests for comment.